I love butterflies!! Just think how awesome it would be to have such colorful butterflies flying all around you! This is my latest DT project for All Dressed Up Stamps. For this card I chose to work with the utterly adorable Hippie Chick. The dies are from My Favorite Things and Lawn Fawn. The paper is from my stash. Seriously…how fun would it be to be a mermaid? This adorable little mermaid couple is from Tiddly Inks Stamps. For my guest design project this month, I will be joining the whole team in creating with these little sweeties. I printed the image at a height of 3.25″ on X-Press It Blending card and colored the little cuties with the following Copic markers. I started with a card base is 5.5″ with the layers each being 1/8″ smaller. The background is colored with watercolor paints on watercolor paper. Once dry, I used the largest scalloped edge frame and the second smallest single stitch line square frame from My Favorite Things to create the texture for the background. I created the sentiment in Microsoft Word (Sunny Day Font) and then die cut it with a sentiment strip die from My Favorite Things. The seaweed dies are from Memory Box. I cut them out of X-Press It Blending card and colored them with the Copic markers listed above. This adorable image is free during the this month’s challenge. You can find the image here. You can find lots more gorgeous images here. I have some exciting news to share with you!! 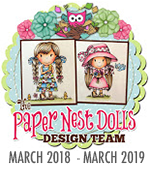 I was asked to join the design team for Magnolia-licious…so you will be seeing the adorable images from Magnolia Stamps grace the walls of my blog. 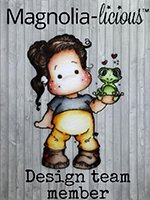 I stamped this little sweetie on X-Press I Blending Card and then colored her with the following Copic Markers. The dies are from Polkadoodles, La-La Land Crafts, My Favorite Things, Gummiapan, and Cheery Lynn. The rolled roses were made with a die from La-La Land Crafts, the paper flowers are from I Am Roses. The paper is from Echo Park. As always, you can find all kinds of cuties and goodies in the shop here. 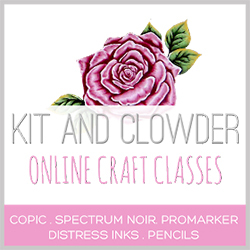 I am sharing a little cutie that was offered as a freebie in the Kit & Clowder facebook group. She is from HAnglar & Wings…how sweet and adorable is she?! You can find her here until 3/31/19 as long as you follow the instructions. The technique I used on her dress is from a monthly marker class available through Kit & Clowder. She is amazingly talented! You can find her classes here. The dies are from Cottage Cutz, Cheery Lynn, La-La Land Crafts, and My Favorite Things. The paper is from my stash, flowers are from I Am Roses. These stamps are so adorable!! I know I will be purchasing more. Today I am my sharing a little cutie for Conie Fong called Bow Tie in my Hair. Such cuteness!! The dies are from La-La Land Crafts, My Favorite Things, and Taylored Expressions. The paper is from main paper is from Echo Park-Spring Fling collection. The little bits are from scraps in my stash. To create the circle frame for the shaker part I took three different dies, taped them together and then cut them out as if they were one die. Today I am sharing a new release image for All Dressed Up Stamps called Busy Street. What unique little shops to visit. The dies are from Memory Box and La-La Land Crafts. The diagonal stripe paper is from My Favorite Things. I am back today to share my DT creation using the gorgeous image from Conie Fong called Serenity. She is SO beautiful and looks so peaceful! Such a pleasure to color. I printed this beauty on X-Press It Blending card and colored her with the following Copic markers. The base card is 5.5 inches square. The dies are from Kaisercraft and My Favorite Things, and the paper is from my stash. To add a little dimension to the vellum circle behind the image, I poked holes in the openings of the doily die. I then used embroidery floss and stitched between the holes. All the layers were popped up with foam tape, including the image. I added a little ribbon, which I tied little knots in, to the bottom of the flower print paper…and of course I just had to add a little bling. I am sharing a sweet little bee from the Paper Nest Dolls called Lulu Bee. This was such a fun image to watch come to life! She is available as a rubber stamp here and a digital image here. I searched and searched for paper for her! I knew what I had in mind and finally found something suitable on Etsy as digital paper. You can find the paper here. The dies are all from La-La Land Crafts. 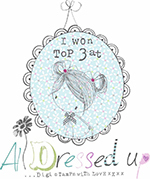 This little cutie is from All Dressed Up stamps, and was such fun to create with for my DT project. I pushed myself to create a “small” card…at least it’s small for me, and I LOVE how it turned out. I printed this sweet image on X-Press It Blending card and colored her with copic markers. The card base is A2 in size. Dies are from My Favorite Things, La-Land Crafts, and Poppy Stamps. The paper is from My Favorite Things. I have some exciting news to share with you all!! 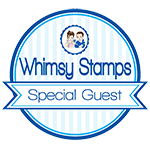 I will be guest designing the month of March and April for Tiddly Inks Stamps. For today’s card I created with the beautiful image called Molly. She is so adorable! I was given beautiful color inspiration to follow from the amazing Seeds Design color palette. This Succulent Hues color scheme is just perfect for some spring fun! The colors are absolutely gorgeous!! The dies are from La-Land Crafts, Spellbinders, and Simon Says Stamp. The paper is from my stash and the flowers are mostly from I Am Roses. I used the biggest die from Spellbinders to cut out the image, which left no die to create the mat with. To get the matting perfect…or close to it…I placed the dark blue cardstock on a cutting mat, taped the same die down with the cutting edge face up, and carefully cut around it with a craft knife. (I use PenBlade and love them).